Lots of folks carry a smartphone, and, at least some of the time, tote a second mobile device—an iPad or other tablet. But some people might prefer a product that combines the two. Similarly, many have come to love the finger-controlled interface popularized by Apple, but might prefer at times to use a stylus, a common tool in the pre-iPhone days. Samsung is hoping to offer all of the above. On Sunday, it’s introducing to the U.S. a phone-tablet hybrid with a large 5.3-inch screen that uses a stylus as well as your fingers. It’s called the Galaxy Note and costs $300 with a two-year AT&T contract. While the Note could be mistaken for a small tablet, Samsung insists it’s a phone that merely offers some of the roominess of a tablet. And in fact, it runs the last purely phone-oriented version of Google’s Android operating system, called Gingerbread. This product positioning may be due to bad memories of another company’s effort to sell such a ’tweener: Dell’s 5-inch Streak, which was marketed as a tablet that could make calls and failed miserably in 2010. The S Memo app lets the Note’s stylus draw in different colors and to emulate a brush or marker. As a mobile phone, the Galaxy Note is positively gargantuan. It’s almost 6 inches long and over 3 inches wide. When you hold it up to your ear, it pretty much covers the entire side of your face. You look like you’re talking into a piece of toast. The Note is so big, an iPhone can almost fit within its display. And it dwarfs even the more-bloated crop of recent Android phones, like Samsung’s own Galaxy S II series, whose screen can be as large as 4.5 inches. And while it can fit into a large pocket or handbag, the Note isn’t going to slip unobtrusively into your jeans or a small purse. It weighs 6.28 ounces, nearly 30 percent more than the iPhone and nearly 50 percent more than some Galaxy S II models. For people who use Bluetooth earpieces all the time, or who primarily use the speakerphone function, the Note’s size may not be a problem. But for the rest, the Note is just too large to go without a more reasonably sized phone, which defeats the one-device argument. Voice quality in normal use was good. But, in my limited tests of its Bluetooth voice capabilities, the caller on the other end felt the Note sounded significantly worse than the iPhone or other Android models I’ve tested. However, as a data device, I liked the Note a lot. Its screen sports a high resolution that made photos, videos and text look very good. It uses AT&T’s high-speed LTE data network, where available, and in my tests it was very fast. The larger screen enabled more of a Web page to be visible without scrolling than on typical phones. Like all Android devices, it has fewer, and, in my opinion, generally lower-quality third-party apps than the iPhone. But those I tried worked well. The Note was consistently speedy and responsive. The 8-megapixel rear camera and 2-megapixel front camera both did a good job. Photos and videos I shot from the rear camera were excellent. But I found the sheer size of the Note undercuts its convenience as a camera and there’s no dedicated camera button or quick way to launch the camera when the screen is locked, as there is on some other phones. In moderate mixed use, where I played music and videos, surfed the Web, texted, used email constantly and took pictures, the Note’s battery lasted more than a full day between charges. Unlike Apple, Samsung allowed AT&T to load a bunch of its own apps you might not want on the Note, like a $10 to $15 a month program for locating family members via cellphone GPS. A particularly egregious example is a Yellow Pages app that’s jammed into the very top of your contact list. Another drawback: While other Android phones I’ve tested can be plugged into either a PC or a Mac so you can manually transfer files onto them, I couldn’t get the Note to do this with either of two Macs I tested with it. It did work with Windows machines. The stylus is a big plus, at least for users who like to jot down notes, create sketches or annotate documents in a way that’s much more precise than using a fingertip. Even on the iPad, which wasn’t designed for a stylus, third-party styli have become quietly popular, but Samsung has taken the idea much further. 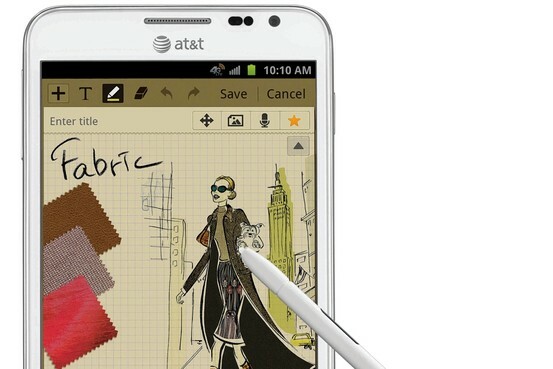 The Note’s stylus, called the S Pen, can be used instead of a finger to launch and operate apps. But that isn’t its main purpose. It’s meant to work closely with a special app called S Memo that allows you to take notes or make sketches. These can be saved or shared via email or text messaging, or uploaded to sites like Facebook. They can include photos or typed text. The software allows the stylus to draw in different colors and widths and to emulate a brush or marker. A button on the side of the stylus can be pressed while tapping the stylus on the screen to bring up a light version of S Memo for quick notes, or to capture whatever is on the screen as a photo that you can annotate with the pen and send off to others. Samsung plans more pen-oriented apps, and there are some games and drawing apps for the stylus. Some similar apps are available for the iPad and iPhone, but Samsung is investing more in the stylus and what it can do. For people who like jotting notes or sketching, the stylus alone could be a reason to buy the Note. The Samsung Galaxy Note isn’t for everyone, and I can’t recommend it as the main mobile phone for most people. But as a stylus-driven small tablet, it might be just what some users are looking for.